The major search engines are making real-time search a priority, resulting in good visibility opportunities for news sites especially for breaking news. Google, Bing and Yahoo are all experimenting with various forms of real-time results now and making deals with Twitter, Facebook and other social sites. So how can news sites maximize their real-time search visibility? It should be noted that there many forms of real-time search including Twitter Search itself and sites like OneRiot, Collecta and Topsy, among others. But in this post I am focusing on real-time results in the major search engines. 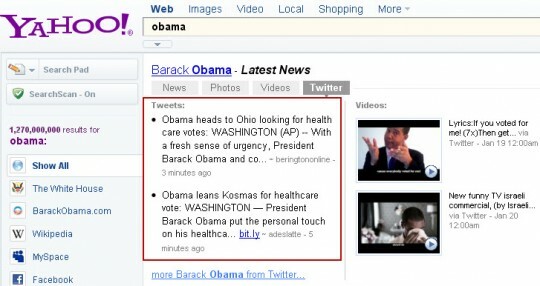 First, a quick look at how news content is currently being included in real-time search results. In its “Latest results” Google blends results from Google News and Google Blog Search with updates from Twitter and Facebook Pages, offering multiple paths in for news and content sites. For example as news was breaking on the Chile earthquake a couple weeks ago The New York Times created a Twitter List to pull together the latest information from a variety of sources. 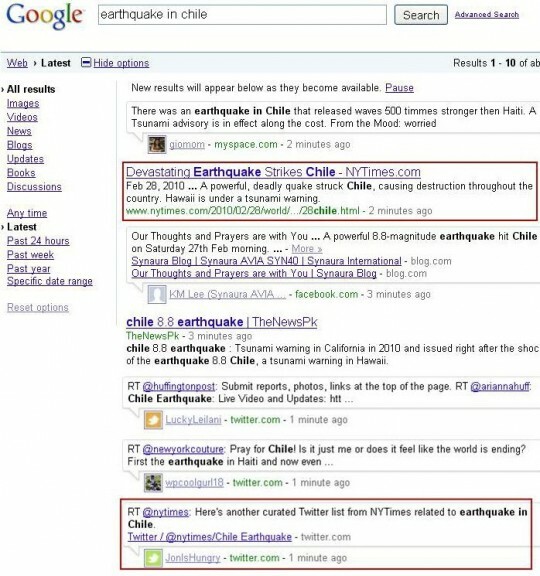 The Chile Earthquake list was shared quite a bit on Twitter causing it to appear frequently in real-time search results. In this particular case The New York Times was not included in the top links section but it did appear in the regular tweet stream. The fact that Bing identifies the source of any shortened URL helps credible news sources to stand out, particularly in the top links section where the domain for each link is referenced four times. However links to news content are often included in the highlighted tweets and Yahoo plans to incorporate more real-time content soon. As can be seen, news sites have some real advantages in competing for real-time search visibility particularly in Google and Bing. News organizations can quickly gain multiple listings and sustain them for a period of time through user retweets. This combined with the fact that well-known, trusted sources stand out from the clutter increases the likelihood of getting clicks. So what can news sites do to maximize their visibility in real-time search? If you have any additional tips or observations, I’d love to learn them. What are you doing to increase the real-time search visibility of your content? Some new developments: Google is now including “Top Links” with its real-time results and is allowing users to zoom in and “replay” tweets from specific dates and times. 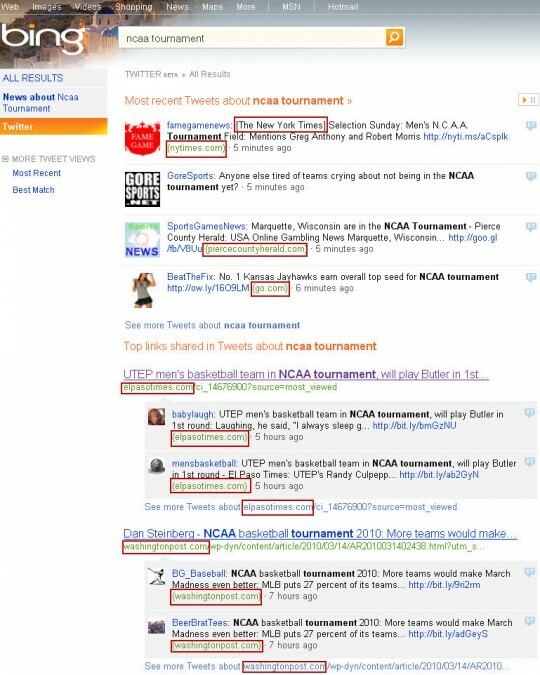 And Bing is experimenting with blending Twitter results into its main Web results. Do People Search for “Breaking News”? thanks for all the great info. During my seminars, I tweet than go live to show real time results. Last week in Wichita KS I did some examples using Twitter and YouTube+twitter and showed how that worked. I just finished a quick post about my Twitter account now ranking #1 for the terms I was playing around with! http://www.localsearchpilot.com/local-search/twitter-seo It makes me wonder how soon tweets will get more staying power organically. Thanks Jason. I’ve seen Twitter accounts rank well in Google Social Search for specific queries like that, but not regular Web search, that’s interesting.